Maybe you’re try to make a big splash for Valentine’s Day. Flowers are pretty expensive for a present that wilts so quickly. Chocolates are downright cliche at this point. How do you show your affection for your beloved while setting yourself apart from the traditional pack? Fortunately, several food manufacturers and restaurants are here to help, with a multitude of V-Day themed marketing deals. For example, Cinnabon’s Heart-Shaped CinnaPacks, in a 9-count pack of MiniBon Rolls, are bound to make more of an impact than a heart-shaped box of chocolates (available at Cinnabon bakeries). Or maybe go for that same familiar packaging with a heart-shaped box filled with 30-count Chick-fil-A Nuggets or 10-count Chick-n-Minis from Chick-fi-A. Going for something more bouquet-shaped? Bacon Bouquets offer bouquets of “bacon roses” matched with everything from chocolate-covered cherries to beef jerky (unfortunately, they are sold out for Valentine’s Day delivery, but maybe you’ll still be in luck if you push your V-Day celebration off until the weekend). Grillo’s Pickles offers a DIY pickle bouquet. 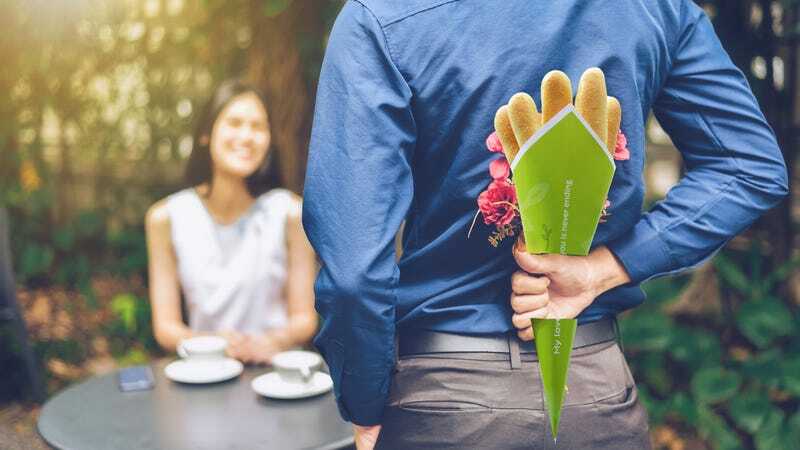 Olive Garden has released downloadable templates so that customers can craft bouquets out of their unlimited breadsticks, with messages like “love at first bite” and “My love for you is neverending.” The breadsticks can be part of your To-Go Olive Garden Valentine’s Day Dinner, starting at $35.99. If you do want to stick with the traditional chocolate, Walmart has this bouquet made out of Reese’s and M&M’s for a mere $37. Might possibly go over better than pickles, but then it takes all kinds on Valentine’s Day.